From the announcement here (2001/10/28), "During the keynote session at the GLGDW conference in Milwaukee, Microsoft Visual FoxPro product manager Ken Levy announced that long time FoxPro community member is the first recipient of the FoxPro Community Lifetime Achievement Award. Author many VFP books; Speaker at VFP conferences world wide; Ultimate FoxPro Reference ? TUFPR (two-fer); Editor Pros Talk Visual FoxPro series; Editor of FoxTalk for many years; VFP book publisher: hentzenwerke.com; Early adopter of GenScrnX; Contributor to VFP certification exams; Promotes FoxPro on own time/money; Articles for forming and managing FoxPro user groups; Editorial columns for Information System Consultant (ISC); Former marathon runner, competitive while a big contributor; Master of bonus sessions at FoxPro conferences; ?VFP 7.0 Only? session at WhilFest 2001 to promote upgrades; Hentzenvision (said down two octaves); A good friend of, and to, the late Tom Rettig; Microsoft MVP for Visual FoxPro." Contributor, Columnist and Editor of FoxTalk, 1993-2003. Former owner of FoxTalk here. Wrote first article for FoxTalk in 1993, "Printing Bar Codes on HP LaserJets from FoxPro/DOS". Became "Cool Tool" columnist in June, 1994. Became editor in February, 1996. Resigned in September, 2003, with last issue in March, 2004, in order to devote time to Linux. 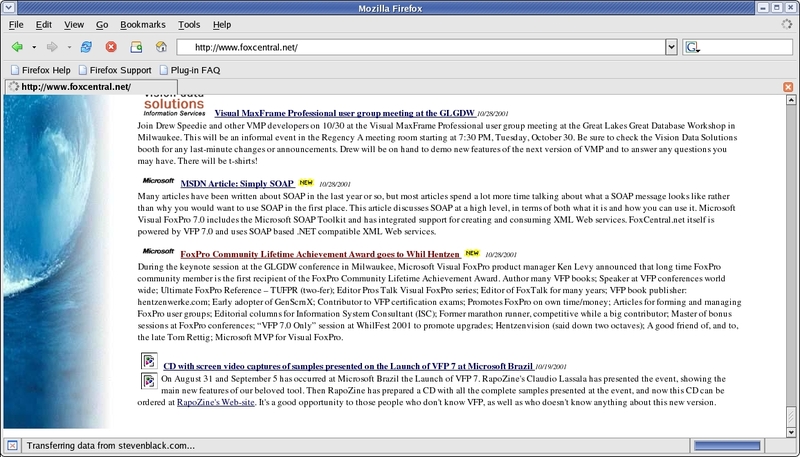 Regular contributor to FoxRockX (here), FoxTalk's successor, in 2012.